I am fairly well bored with flying the same old stuff at indoor meets so I availed myself of a couple of models from the 'micromodeldrome' site . See the 24 Sept 2014 entry on the PMFC website. I felt that these might be a challenge aerodynamically and control wise. 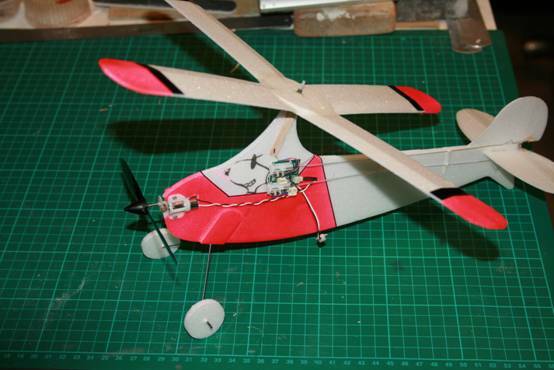 The Autogyro : Surely everyone should attempt an autogyro before they leave this mortal coil and this is my attempt based on an inexpensive laser cut Depron kit. The RX is a spare from a trashed Ember and has 2 linear servos run by 6mm (?) pagers with an onboard ESC of unknown current capability, I guess at about 1.5amps. The motor is a brushed, geared Parkzone 8mm from a P51D. AUW is about 45gms. The Shockie : A conventional Shockie is 7-800mm span with a 30-50 Watt brushless motor weighing about 80-120gm. This would not be user friendly in a hall shared with FF peanuts and RC Embers. 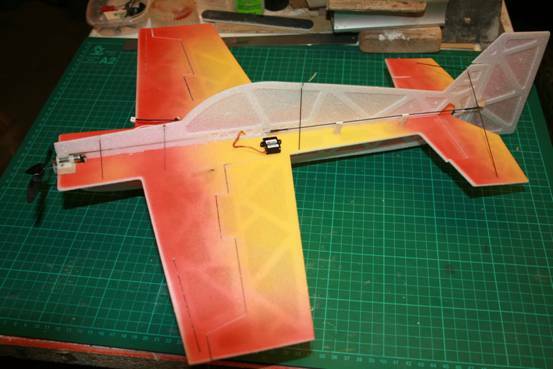 The micromodeldrome shockie is a mere 350mm and was built with a 2 servo wing so that the ailerons could be drooped for super slow flight. AUW is just less than 40gm. 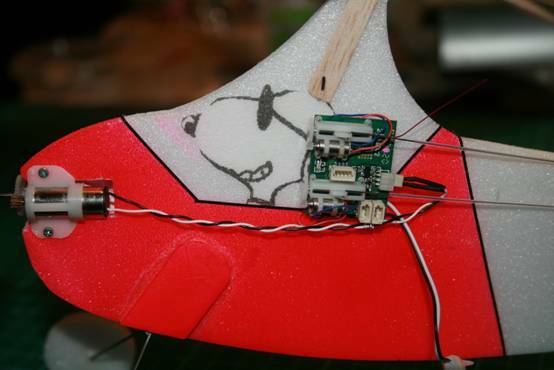 Servos are 1.8gm digitals from Robotbirds driven by a DT (Deltang) RX34. This was a mistake as this RX has 2 built in ESC's for differential steering neither of which can be accessed from the TH input. I had to use a 2gm brushed stand alone ESC for the Horizon geared 8mm pager. I have some doubts as to whether this motor will be man enough for the job but I am trying to avoid the weight of a brushless. Both of these RX's run DSM2 systems consistent with the Spektrum TX. I use a DX6I under sufferance as the software, instruction manual and screen are poor compared with MPX. It is, however, first choice for indoors mainly due to the lightweight RX's offered by the aftermarket, not forgetting Spektrum's own AR6300/AR6400. See these at Bushfield but only if its lousy weather, its Midland Gala at Luffenham on the same day as the first Bushfield.